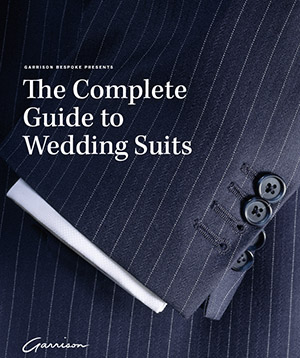 When dressing the groom, think about the ways he can stand out in the sea of suits. We’ve all come to terms with the bride being the center of attention on your wedding day, but that doesn’t mean you – the groom – need to sit on the sidelines. Instead, let’s try and make you standout alongside the love of your life! Here’s how the groom can make his mark on his special day. Match your bride: If your bride is wearing a formal gown, then you should wear a tuxedo (instead of a suit). If your bride is wearing a more casual gown, then you should wear a more casual looking suit – maybe something linen! Your guests will be coming in general wedding attire (unless specified) and therefore it is up to you and your wedding party to lead the theme for the day. 1. Try an alternate tuxedo. Wearing an alternate tux or wedding suit from the rest of your groomsmen can enhance your importance on your wedding day. An example would be to opt for a cut away coat and have your groomsmen wear stroller coats. Similarly, you could opt for a single breasted jacket and let your groomsmen wear double-breasted jackets – or vice versa! A simple design change can be an elegant difference. 2. Don a more sophisticated flower. This is the easiest way to stand out as the groom. While your groomsmen can wear simplified boutonnieres, yours can be more elaborate. Though, you and your groomsmen should have identical flowers, yours as the groom can have additional, flower buds, berries or foliage accents such as rosemary, sage, and dill. Another option is for the groomsmen to wear buds of a flower and yours be fully open bloomed. 3. Pick a different tie: While your groomsmen can wear simple ties, yours can be much more elaborate. A bigger knot (such as a Windsor, Eldridge, or Ascot) can instantly stand out from all the other neckties. Also a different pattern or shade from your groomsmen’s ties can help you rise above the crowd. For example, your groomsmen can be wearing a simple lavender ties, while yours is a regal purple one with bold silver dots. More simply, your groomsmen can be wearing tuxes with black bow ties and black waistcoats, while you wear a white bow tie and white waistcoat. 4. Change up the waistcoat: Grooms have the option to switch it up by wearing a different colour than the groomsmen. Or instead of having a waistcoat, wear a cummerbund and let your groomsmen sport the waistcoats. 5. Change up the minor details: Socks, lapels, pocket handkerchiefs and cufflinks. Switching it up to contrast what your groomsmen are wearing is another good idea. If your groomsmen are wearing simple accessories, you may want to sport bolder items and vice versa. 6. Wear different shoes: Never ignore the power of your shoes. Make sure that your groomsmen and you are sporting sleek footwear (the wrong footwear can ruin the outfit). As the groom, you can take it up a notch and wear a pattern or a shade that is different than your groomsmen. For example, you can opt for baroque shoes while the rest of your boys wear leather shoes that have a minimal to no design. Optionally, if your suit allows brown leather shoes, then you could have a darker or lighter colour of brown than your groomsmen. In the end, your wedding day is about the bride AND the groom; and as the groom, it is your duty to step up to the plate and shine alongside your bride. You don’t have to follow all these tips; pick and choose which you prefer and rock with them! Head into Garrison and speak to one of our expert stylists on how to make yourself the ultimate standout groom! Visit our new King Edward Hotel location, where Garrison Bespoke has launched North America’s first wedding space for grooms!